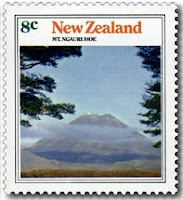 Virtual New Zealand Stamps: 1972 - 1973 Scenic Stamps. 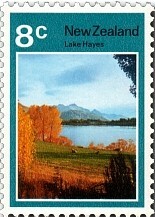 1972 Scenic Stamps - Lakes. 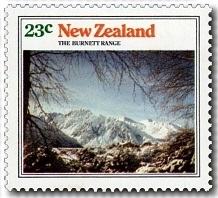 The first issue of what was to become the annual Scenic Stamp Issue appeared in 1972. 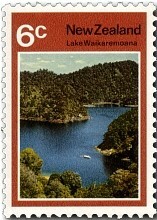 This was a four value set depicting Scenic Lakes.
. Perhaps the most beautiful lake in the North Island, Lake Waikaremoana is located in Te Urewera National Park in the North Island of New Zealand, 60 kilometres northwest of Wairoa and 80 kilometres west-southwest of Gisborne. From the Maori Waikaremoana translates as 'sea of rippling waters'. Covering an area of 54 km², its star shape of deep blue water and surrounding green of forested mountains makes it a breath-taking sight. Situated in the heart of the Southern Lakes District not far from Queenstown. It was named for a Donald Hay who sought land in the area. However, a theory persists that it was named after the notorious pirate Bully Hayes. It is a smaller lake where recreation activities include boating and fishing. Exotic fish in the lake that can be taken recreationally include brown trout and perch, while native fish include upland bully, koaro and long-finned eel can also be found. A celebrated lake of the Rotorua District. Lake Rotomahana is three square miles in area and occupies an extremely deep volcanic crater. Originally it was much smaller in area and on its slopes were two of the most beautiful spectacles of this thermal area, the pink and white terraces. Both terraces disappeared after the historic eruption of Mt Tarawera in 1886. After the eruption the geography was found to have been substantially altered with lake covering a much larger area as it refilled. Take a look at this photo below. What does it show? A fly-fisherman standing in a river! 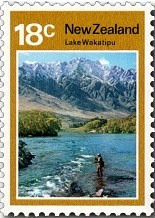 Yes its a river when the title and supposed subject of this stamp is Lake Wakatipu. The river is actually the Kawarau River, which outlets from Lake Wakatipu, rather than a view of the actual lake itself. Probably if we could turn the camera around, we would likely see Lake Wakatipu. A startling and rare colour variety of the 23c stamp exists with a border colour half way between the correct Sage Green colour of the 23c and the Ochre colour of the 18c stamp (shown in the middle in the photo above.) The stamps were printed in four-colour photogravure by Courvoisier of Switzerland and the variety is possibly a missing colour. 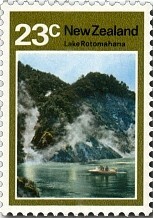 1972 Lake Scenes addressed FDC. 1972 ´Lake Scenes´ FDC - addressed to England. 1973 Scenic Stamps - Mountains. 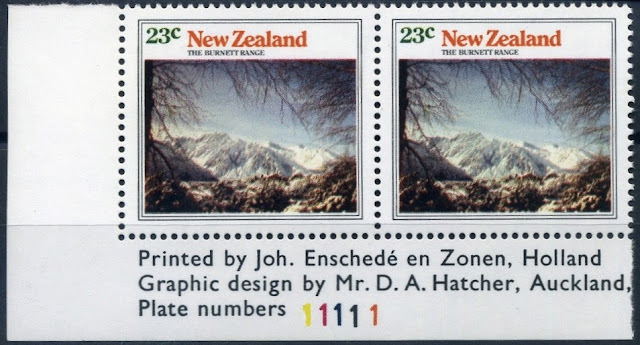 The second Scenic issue of 1973 depicted four New Zealand mountains. Again the same four value issue was used but in this case the stamps format consisted of two portrait and two landscape photographs. The peak was named for its resemblance to the shape of the bishop's mitre or head-dress in 1851. Mitre Peak, rising 1,695 metres above the waters of Milford Sound, presents its most striking face to the guests at the Milford Hotel from where the picture featured is taken. Closer inspection of the peak reveals its myriad waterfalls fed by the high rainfall in the area. 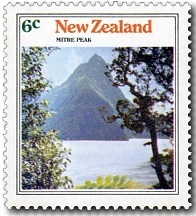 We did a study of how many times this mountain has appeared on New Zealand stamps Mitre Peak / Milford Sound. Riseing 2,286 metres, Mount Ngauruhoe is an active stratovolcano or composite cone in New Zealand, made from layers of lava and tephra. It is the youngest vent in the Tongariro volcanic complex, first erupted about 2,500 years ago. Although seen by most as a volcano in its own right, it is technically a secondary cone of Mount Tongariro. Together with Mt Tongariro and Mt Ruapehu it makes up main attractions of Tongariro National Park in the centre of the North Island. Mount Ngauruhoe was used as a stand-in for the fictional Mount Doom in Peter Jackson's The Lord of the Rings film trilogy. The ice-encrusted precipices of Mt Sefton named by Maori Maunga Atua - Mountain of the Gods - rise 2,134 metres to its 3,155 metres summit. 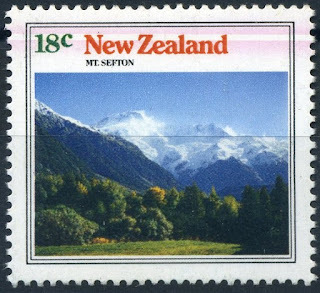 An early resident, Charles French Pemberton, named the area, whilst the geologist Julius von Haast named the mountain after William Sefton Moorhouse, the second Superintendent of Canterbury Province. When viewed from the South Island tourist resort of The Hermitage the view of Mt Sefton surpasses that of Mt Cook. Mt Sefton is noted for its avalanches. The Burnett Range lies between the Tasman and Jollie Rivers in the foothills of New Zealand's Southern Alps and is also visible from the Mt Cook tourist resort, The Hermitage. and a blurring of the whole picture. 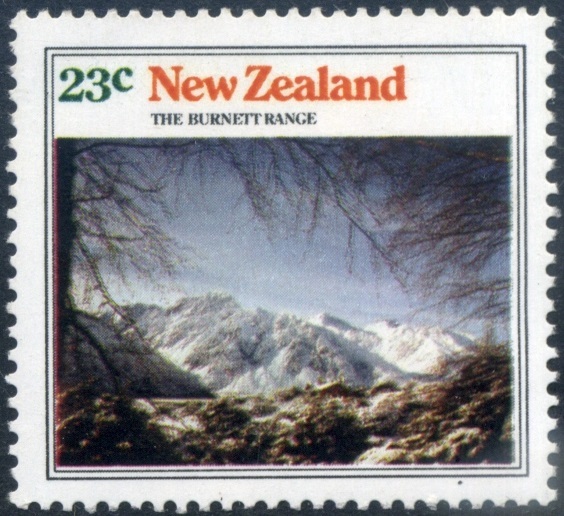 Left Stamp:- 1973 Mountains 23c value with small red colour shift to left. This can best be seen with the fine red line down the left side of the picture. 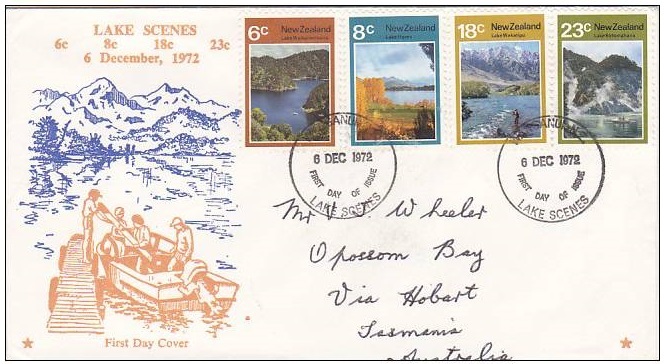 1973 ´Mountain Scenes´ FDC - addressed to England. 1972 Scenic Issue Technical information. 1973 Scenic Issue Technical information.